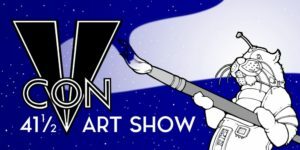 Come chill out with me at VCON Relaxicon (41½) this month. It’s happening from Saturday, October 28th to Sunday, October 29th at the Sheraton Vancouver Guildford Hotel in Surrey. Swing by the art show to check out my Geisha Girl Survivor artwork. I’ll have framed and unframed prints for sale. Also pay the Edge Science Fiction and Fantasy Publishing booth a visit as I will be hanging out there for a bit too. Edge is out to promote a number of books, including Compostela: Tesseracts Twenty. My short story “Grounded” is in this anthology and it is edited by the fabulous Spider Robinson and James Alan Gardener. Come out and enjoy the chill vibe and hope to see you there.